Special birthday gift ideas are timeless. What was your favorite gift ever? Can you recall your excitement opening the present? Maybe you even had butterflies in your stomach! Well that's what this site is all about! I'm going to help you give the best birthday gift ever. You'll love these unique birthday gifts - many you've never seen before. Plus - many unique birthday gift ideas for the 21st, 30th, 40th, 50th, and 60th celebrations. Don't forget the funny gag gifts . . . sure to be the life of the party. I have birthday gag gifts for the 30th, 40th, 50th, and 60th birthdays. Nothing ordinary ~ only extraordinary. I really hunt for the uncommon. I'll show you great finds for all tastes and budgets. Plus, I'm adding more and more birthday gift ideas every week! So, make sure you bookmark this site and visit often. Are you challenged by the hard to buy for? I know what you mean. My darling father-in-law used to tell us what he didn't want for his birthday....not what he did want. But we loved him so much, we wanted to make sure we gave him something really special. Are you tired of hearing . . . "I don't need anything" or "No more shirts!" Well, I'm here to help. So make sure that you take a good look around. You'll be hearing, "WOW! Where did you find this? I love it!" Maybe they would enjoy a fun gift basket. I'm constantly amazed at the varied and unusual birthday gift baskets I find. I'll share lots of fun gift baskets filled with chocolate, wine, fruit, and flowers to name a few. • irresistible gourmet chocolates and more. • golf gifts that his buddies will envy and more. Here's to the . 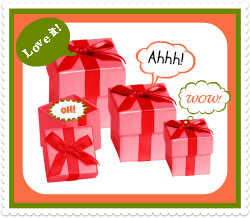 . .
Oohs and Aahs, gasps of excitement, giggles and belly laughs!Get ready to give the unforgettable birthday gift. 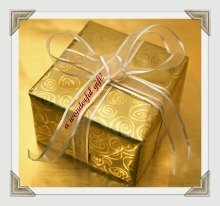 The Birthday Gift Blog keeps you up-to-date with all additions and changes to the Carols-Birthday-Gift-Ideas.com Web site. Subscribe here. The Best Birthday Gifts for Her! Surprise her withhese top birthday gift ideas for her that she'll love! Coolest birthday gift ideas for him. Coming up with the best birthday gift for him . . . can be like treasure hunting. If you're lucky - you strike it rich and find something he loves. Funny gag birthday gifts put life into the party. Click here for the coolest birthday gag gifts. Looking for the best birthday gift baskets? You're in the right place! This gift starts with a basket and ends with a smile! Homemade birthday gifts are thoughtful and cherished! Homemade birthday gifts are thoughtful and cherished! Click here for lots of ideas for homemade gifts to make. Looking for romantic birthday gift ideas? Click here for the very best! Carols Birthday Gift Ideas is your one stop shop for all of your birthday present needs. 40th birthday ideas that celebrate the occasion in a BIG way! From gifts to parties check out the top picks. Need 50th birthday gift ideas for someone special? The best 50th birthday gift is unique jewelry. OK, you asked for it so here it is....cheap birthday gifts. But I'm going to put a spin on it. These gifts are going to be cheap in the price alone. Beer: male birthday gift ideas. Click here for the coolest birthday gifts for men. Looking for the best bird feeder for gift giving? Here are the most popular. The best chocolate birthday gifts online! Birthday Gift Flowers - Are Creative, Special And Unique. A Kenneth Cole messenger bag make a great gift for him. I'll share some great deals and discounts with you. The top Vera Bradley purses, bags, and wallets. Michael Kors watches have a unique look. These would make an exquisite birthday gift for her. Click to see the best! Find out what's so special about California Wine Gift Baskets. From the exquisite wines to the devine snacks - these gift baskets are my top birthday gift ideas. Would you like to share your knowledge about birthday gift ideas? Great, find out how you can submit your story or tip here. Return from Carols Birthday Gift Ideas to the Site Map to see more!